Songs We Love: Caleb Klauder & Reeb Willms, 'There Goes My Love' The traditional country duo shifts the original, gender-specific lyrical arrangement of the Buck Owens tune, giving it a sense of longing and tenderness. Caleb Klauder & Reeb Willms' new album, Innocent Road, is out now. 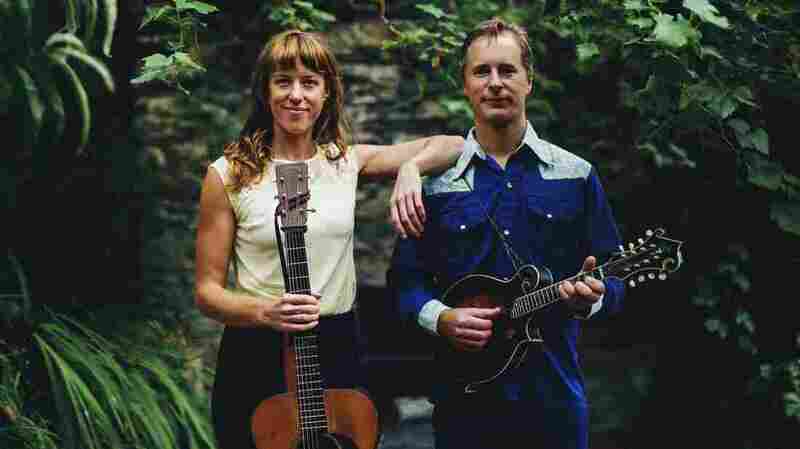 On their new album Innocent Road, Caleb Klauder and Reeb Willms stake a claim as two of the finest traditional musicians in America. Their sound is a throwback to the heyday of rural American dance-hall music. And make no mistake: If they had been born in 1930, the two Portland musicians would be pop stars. But the duo performs classic country music in a modern world that often expects such sounds to be accompanied by kitsch and nostalgia. Nevertheless, they tackle the genre with refreshing verve and sing without an ironic wink. Such earnest delivery is part of their charm, but the sheer weight of their musicianship helps tip the scale fully in their favor. It's actually a wonder Klauder can sing at all. Three years ago, the band began recording Innocent Road at Blue Rooms Studios with engineer Mike Coykendall (M. Ward, Bright Eyes, Blitzen Trapper). Halfway through the process, they hit an unexpected roadblock when Klauder began experiencing difficulty with his voice. He was eventually diagnosed with vocal polyps, and the recording session had to be abandoned. But that was the least of his concerns. "I was a puddle of tears on the floor," Klauder recalled before a recent hometown show at Doug Fir Lounge in Portland. "I was a wreck. I thought I would never sing again." Successful surgery and intense vocal therapy and coaching followed, allowing Klauder to resume singing live and eventually finish the record. Although Innocent Road features a bevy of original songs, the duo shines brightest in a Buck Owens cover. It takes guts to play Buck. Dwight Yoakam is pretty much the only person to have properly revisited the country-music titan's catalog in the past 50 years. But Klauder and Willms seem unfazed by the task. Willms takes the lead in Owens' 1957 classic "There Goes My Love," immediately shifting the dynamic of the original, gender-specific lyrical arrangement. (The White Stripes' rendition of Dolly Parton's "Jolene" comes to mind.) Her voice lends the song a sense of longing and tenderness that the original never had. Willms is expertly backed by the weeping pedal-steel guitar of Rusty Blake and mandolinist Klauder, whose raspy, rebuilt voice provides some tastefully frayed edges. Innocent Road is out now through Caleb Klauder/West Sound Records.